"Let's go back in time to 1997 when a hit game came out for our PC called Jedi Knight: Dark Forces II. Sound familiar? 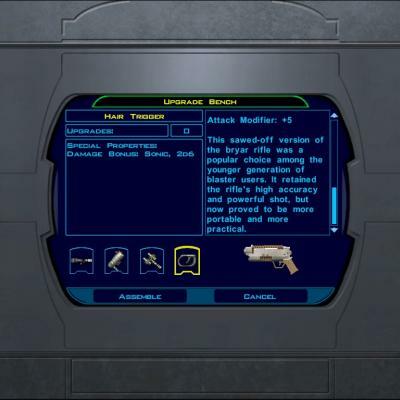 Maybe the game was before your time, but there was this character named Kyle Katarn who learned the ways of the Force and became a Jedi and ended up defeating seven different Dark Jedi to help protect the Valley of the Jedi from falling into Jerec�s hands. Well, during that game you can see Kyle use a specific blaster called the Bryar Pistol. Recently Inyri Forge and I were having one of our chats on MSN and she asked for an idea of what blaster she should model for the first Knights of the Old Republic game. 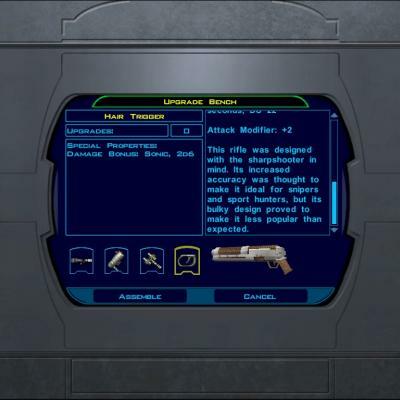 I suggested the Bryar Pistol because I remembered her love for the Dark Forces II game and the character Kyle Katarn played in it and I had this feeling this was a blaster she wouldn�t have been able to resist making. As Inyri went to get references to help model the blaster, she learned some interesting information about it. 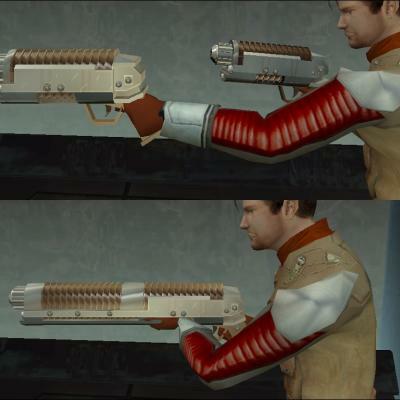 The Bryar Pistol was a sawed off blaster rifle by Morgan Katarn to give to his son before entering the academy. Because of this discovery, the author decided to not only make the pistol, but the rifle too; so this mod comes with two weapons. Copy the contents of the ZIP archive to your computer, then run TSLPatcher.exe and follow the on-screen instructions. Both can be purchased from Kebla Yurt on Taris for 1000 credits each. Some minor hand clipping due to the bulkiness of the weapon. Mostly unnoticeable.